While growing up in Pacific Palisades, California, MS GIS student Max Babcock ’18, ’19 enjoyed visiting Joshua Tree National Park on the weekends. When, as part of his University of Redlands undergraduate Environmental Business program, School of Business Professor Jim Spee mentioned the park in a list of potential projects for senior capstone proposals, Babcock jumped at the chance to work with the park’s employees. So began a four-month-long process, in which Babcock produced 3D sketches, researched materials, and estimated construction costs for the park’s newly acquired Dr. James Buckner Luckie Study Center. In 2017, Dr. Luckie’s daughter, Susan Luckie Reilly, donated her land, garage, and house to the park and Babcock was working to convert it into a bunkhouse for researchers and students. The research conducted at the center directly benefits park management and helps inform decisions on resource management and conditions. 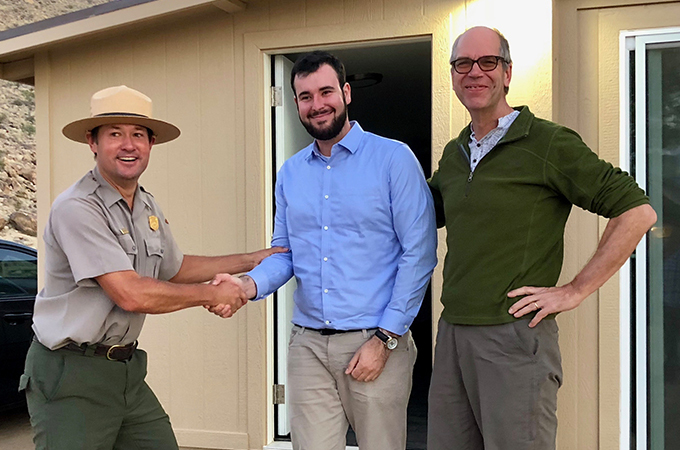 Joshua Tree National Park ranger David Smith (left) thanks University of Redlands student Max Babcock ’18, ’19 (center) last fall for his help in converting a garage into a bunkhouse to serve the park's visiting researchers. Babcock worked on the project under the guidance of School of Business Professor Jim Spee (right). Once the construction was finished, Babcock and Spee attended the October 2018 ribbon-cutting ceremony for the center. During the ceremony, Spee presented the park’s superintendent with an excerpt about Dr. Luckie from Lary Dilsaver’s book Preserving the Desert: A History of Joshua Tree National Park (George F. Thompson Publishing). The framed excerpt now hangs on a wall in the center’s dining room. Spee continues to build on this relationship by encouraging his students to embark on projects in collaboration with the park’s employees. Last November, three environmental studies seniors—Matthew Curtiss ’19, Mika Imoto ’19, and Chase Lipscomb ’19—worked with park staff to test locations for the design of a new campground on a site that includes a vacation home from the 1950s that qualifies for the Historic Register. This is one of the projects that has stemmed from Spee’s 2017 May Term course, Green Building and Historic Preservation in the National Parks. 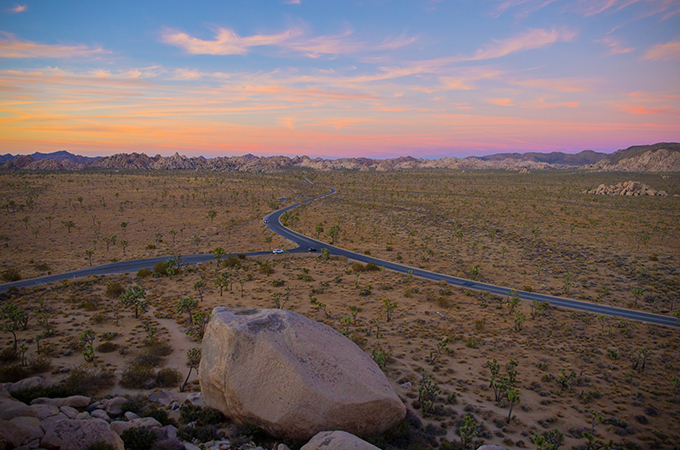 During the course, Spee and his students visited eight parks, including Joshua Tree National Park. When asked how the current government shutdown is affecting students' work, Spee says, "The shutdown has me worried, but, as we are raising funds independently for the project, it won’t have an effect right away." Learn more about the Environmental Studies program, the MS GIS program, May Term, and the School of Business at the University of Redlands.